We have kittens that are ready to go now!!! We are now accepting deposits on our kittens to hold the kitten of your choice. It has become difficult for me to answer every email I receive due to work, kids, furr-kids and everyday chores. If I don't reply, please don't be offended. If you are requesting information, it will help if you will please tell me about yourself, your location, and what you're looking for in a kitten/cat. 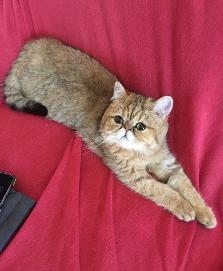 And if you are looking for a breeder, please tell me about your cattery, goals, cattery name, website if you have one, your location and what you are looking for. If you email, call or text and don't hear from me within a few hours (if emailed), please understand I might not be available at that moment to send an response but will get back to you ASAP. If you don't hear from me within 2-4 hours please call/text! You are welcome to email, text or call. We are much easier to be contacted by Email or Text, because sometimes we are busy and unavailable to get to the phone in time but if calling please leave a message and will return your call ASAP! For more information on planned and upcoming litters, email me or check out "Future Kittens" page. If you want a quick response, please send a TEXT Message - if you are able to because I am normally busy 8AM-8:30 PM - I won't be able to pick up but I am usually home after 8 PM EST, so you can call after this if want to speak over the phone. Here you will find new kittens that have been born here. Should they be available, their status will be posted with their photos. Please do not hesitate to ask any questions you might have about our kittens/cats. Please send an email if you're wanting more pictures of kittens. Join us on Facebook and keep an eye on our arrivals and see what our babies look like as they grow up into adults! All Kittens are "Available" on this page; unless Status states "Reserved". I update our page often so our furr-babies new family can ensure there new addition(s) are reserved for them. We give a written health guarantee with each of our kittens. I give lifetime support with my kittens, I care about the health and lives of my kittens even after they leave! Which means, my kittens new families can reach out to me for the lifetime of their cat. My kittens that are going to pet homes must be spayed/neutered by 6 months of age if not spayed/neutered prior to leaving. I reserve the right to spay and neuter any kitten not purchased for an approved breeding program - before they leave my home. NO exceptions! I do on occasion place kittens into breeding homes - cageless cattery only. We no longer hold kittens without a deposit!! 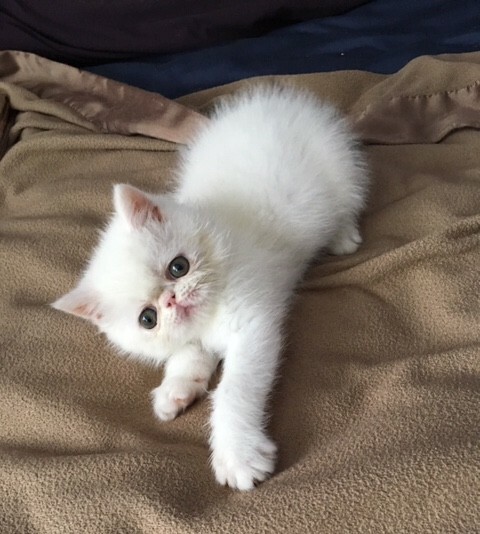 We will have a couple Exotic Shorthair and Longhair Persian adults available to loving homes in April/May... They are current on their vaccinations until 2020. Fully litter box trained. Healthy and friendly! If you want more information and you are looking for a retiree for an companion please contact me. All retirees placed as pets, will be spayed/neutered before leaving. Details: Liam is a very friendly and lovable kitten, he loves to play and enjoys getting attention. By paying deposit means you have viewed and agreed to contract. Color: Solid white with BLUE tail. Details: Noah is a playful boy that enjoys attention and be cuddled with. Would make a wonderful addition to a family. Color: Dilute Calico - BUT.... she is solid white, with color only on her tail and forehead. We do our best to be reasonable in pricing our kittens. So please keep in mind, we price according to their quality, bloodline and what we have in to raise and keep our cats and kittens healthy. You can learn more about price here. We do accept deposits through paypal and accept payments - balance due upon pick-up. Health is whats utmost importance to us. Therefore, our breeding cats have been tested with the current testings that are available to date and are routinely vaccinated and treated for parasite prevention. We do give a written health guarantee with every kitten we place into a new home. Email for a full copy of our contract. Every kitten are dewormed and age-appropriate vaccinations. Shall be healthy to our and our Vet's knowledge. Very socialized and used being bathed/groomed. One(1) year genetic health guarantee. I am always available throughout each and every kitten's adoption process and after kittens go to their new home. All of our babies are Vet checked by a Licensed Veterinarian. We no longer hold kittens while waiting for deposits to arrive as we have many emailing/calling for the same kitten. 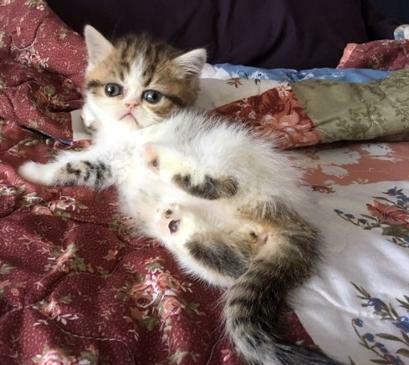 The kitten will remain Available until a deposit is received and we accept paypal for a quick deposit to ensure you get the kitten of your choice. If the buyer for any reason decide to back out from purchase after receipt of deposit paid, buyer will forfeit deposit. Please make sure you want kitty before sending a deposit. Deposits will be considered payment for boarding grooming and lost opportunities for placement. 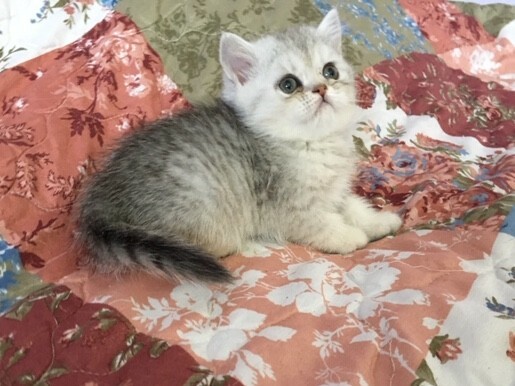 Please understand that I reserve the right to change my mind regarding the sale of any of my kittens at any time after the deposit has been made should I feel that the prospective buyer is not an appropriate match for a particular kitten. If a deposit has already been paid it will be refunded immediately and my decision explained to you thoroughly. Our kittens that are going to pet homes must be spayed/neutered if not spayed/neutered prior to leaving. Deposits are non-refundable as stated and it is also non-transferable to another kitten from the same litter or a different litter once you have agreed on a kitten. So please be sure you WANT that kitten before paying an deposit because it is NON-transferable to a different kitten once you have agreed upon a kitten. If you have paid an deposit on a kitten, that deposit is NON-REFUNDABLE. Deposits will be only be considered REFUNDED if, there is a problem on our end, this excluding any delays in shipping a kitten. So PLEASE be sure you want the kitten. Your Deposit is NON-REFUNDABLE if, you change your mind for any reason whatsoever or, do not pay the remaining cost of the kitten. Occasionally we will have older kittens or young adults available to the right home. We will consider shipping our adults but prefer pick-up and will give preference to local families. Please understand we get several inquiries at one time and do not hold kittens or adults without a deposit as we do not want to miss out on a good home. Thank you for your understanding. Please contact us if you are looking for a retired adult as a pet. Older kittens/retired adult will be spayed/neutered prior to leaving. Our kittens that are going to pet homes will be spayed/neutered prior to leaving - if some reason the kitten is not spayed/neutered prior to leaving, kitten WILL be sold on spay/neuter agreement by 5 months of age. 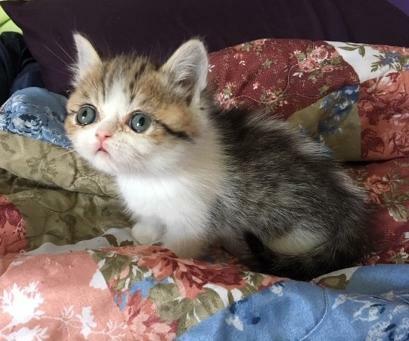 If we don't have a kitten posted here, you've been searching to add to your family... you are welcome to go to our "Future Kittens" page for expecting babies that are due.